After being away for almost two weeks I did the usual thing most people do upon return: inspected the house and yard making sure all was well. Strolling through the garden this morning there were gifts all around just waiting for me to receive them. As I walked out the door onto the patio, awaiting me was the beautiful color shift of the Japanese Maple ‘Crimson Queen’- senescence in full force. 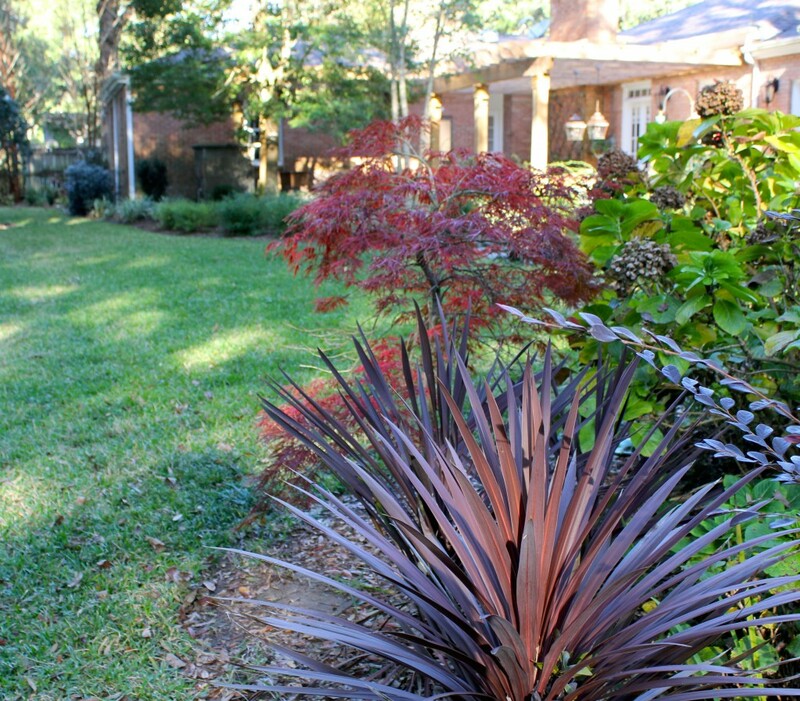 The timing was perfect as I rounded the bend to find the sun beams on the center of the sword like burgundy leaves of the cordyline. Cruising on over to the northwest side of the property I found more presents. 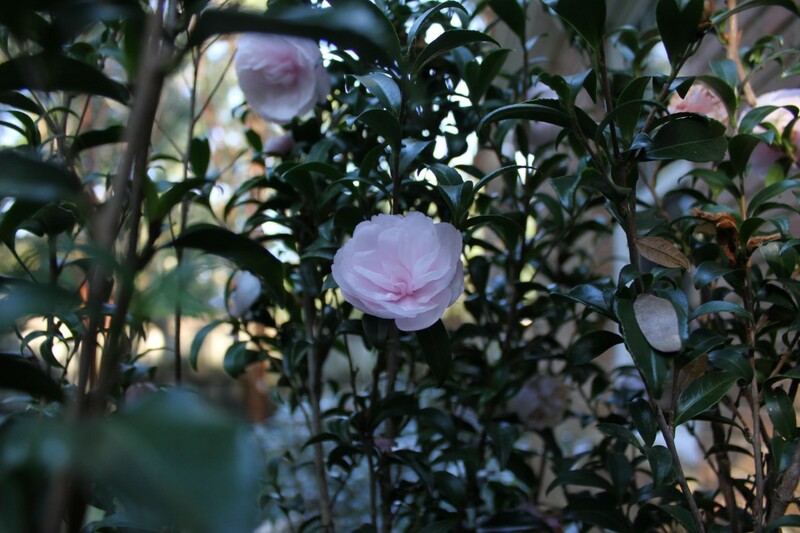 I have two camellia sasanqua ‘Autumn Sentinel’. One had finished blooming but the other still has blossoms for me to enjoy. 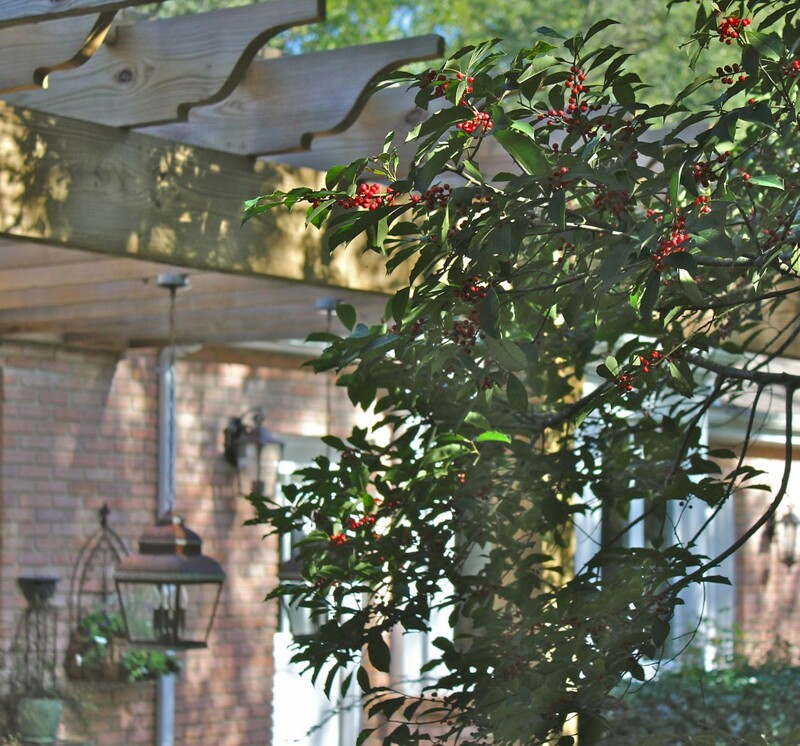 Formally known as ‘Bob Green’ for Bobby Green, the camellia grower in Fairhope, Al., this camellia is narrow and has an upright growth habit with the flowers no more than 2-3 inches wide. So sweet. 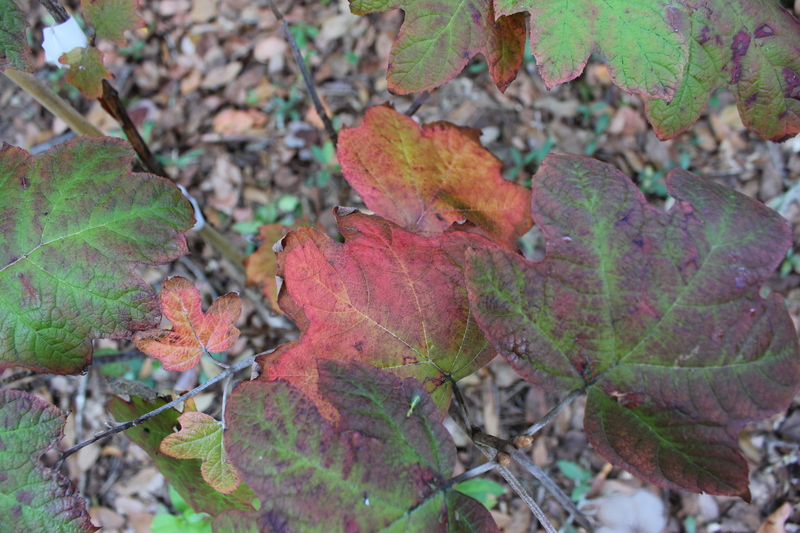 I found Oakleaf Hydrangea ‘Snow Flake’ this year from Petals from the Past in Jemison, Al.- a real treasure. I bought three and much to my dismay, lost one. 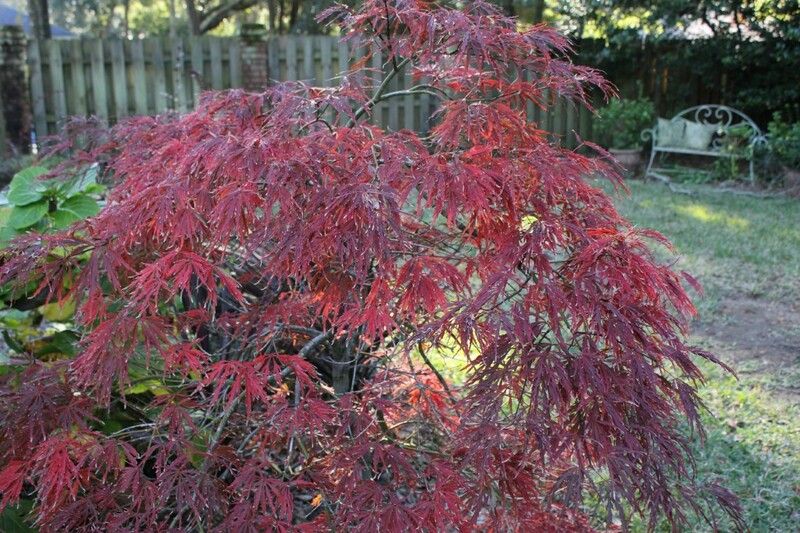 They are small but will ultimately get about 5-6′ tall and wide. What’s special about this particular oak leaf hydrangea is its double florets- I don’t think they are a “true” double flower but it looks like it. It opens white and then as it ages the tips turn pink- absolutely gorgeous- I was smitten with it the first time I saw them in Huntsville, Al. about a year and a half ago. 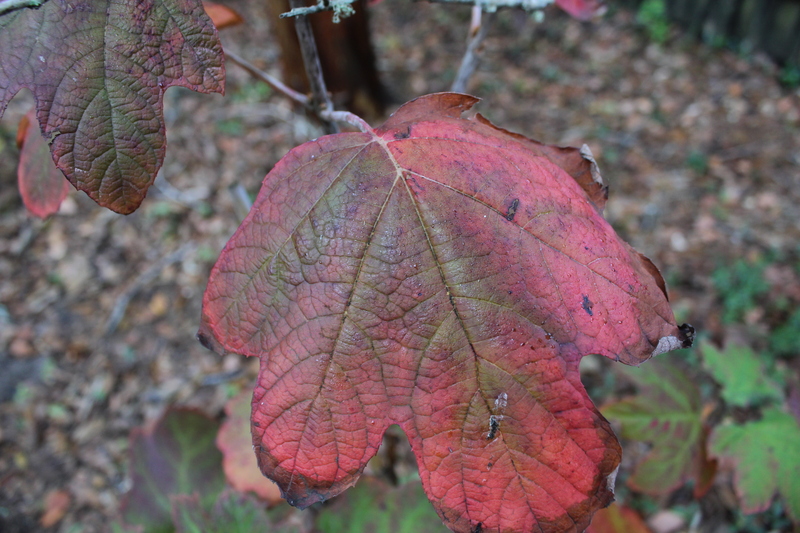 An added benefit is the glorious rich burgundy color the leaves turn in the fall. On my way home from the Landscape Your Life garden workshop in Charleston last year I stopped in Beaufort to visit a friend I haven’t seen in years. We did our reconnecting as we toured her landscape and garden, and all the while Barbara dug things up for me to take home to my garden. 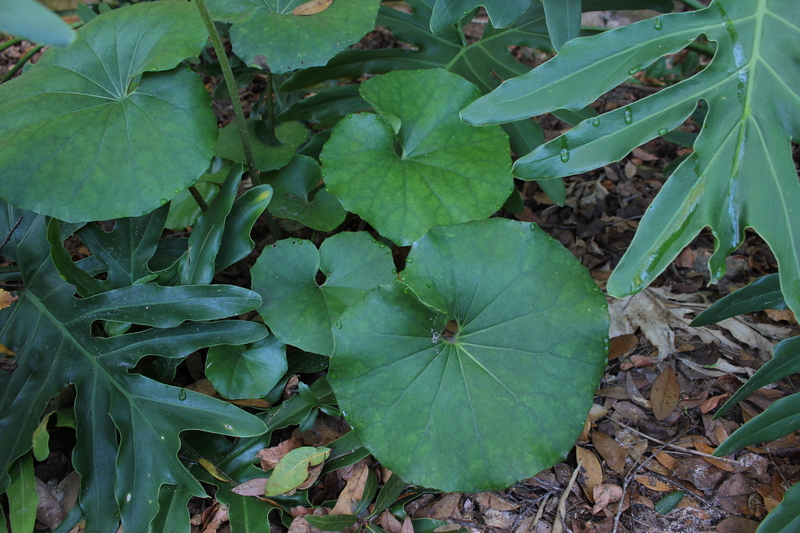 The farfugium was one of the many horticultural gifts she packed in my car. 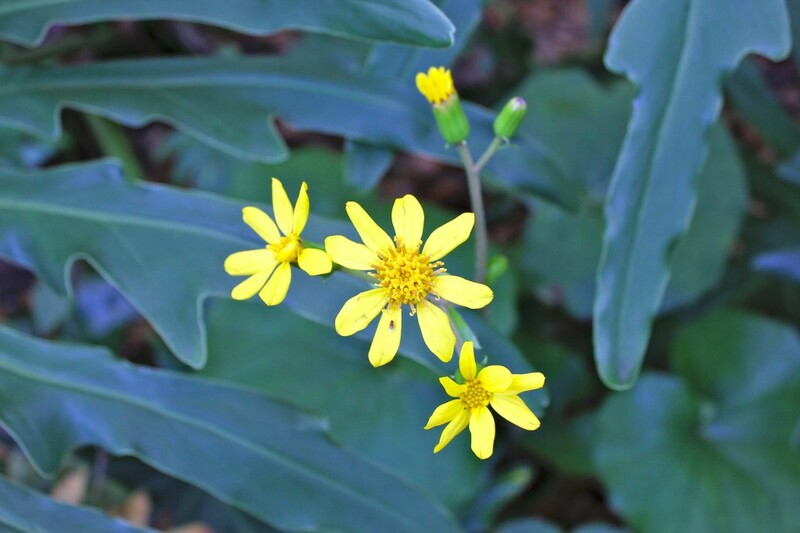 So, I just thought it was great for the interesting foliage- little did I know it would bloom a bright yellow daisy- like flower on a long stalk. That would be Barbara, to leave me with a surprise. Nothing like red to bring on Christmas! From my house to yours- I hope you have a Merry Christmas!